Home Features Celebs Undercover: Would You Spot Them in the Street? Celebs Undercover: Would You Spot Them in the Street? The more seasoned celeb super-fans among us like to think we can easily clock our idols from a mile away. Celebrities may be famous for dressing down and donning disguises when walking the streets with us mere mortals, but surely the true fans would be able to see through that every time? One genre of entertainment that continues to enjoy huge popularity to this day is undercover celebrities, where the world’s biggest A-listers disguise themselves as normal people and get involved in some hilarious interactions with the public. Here are some of the best cases of undercover celebrities through the ages – do you think you’d be able to spot them? 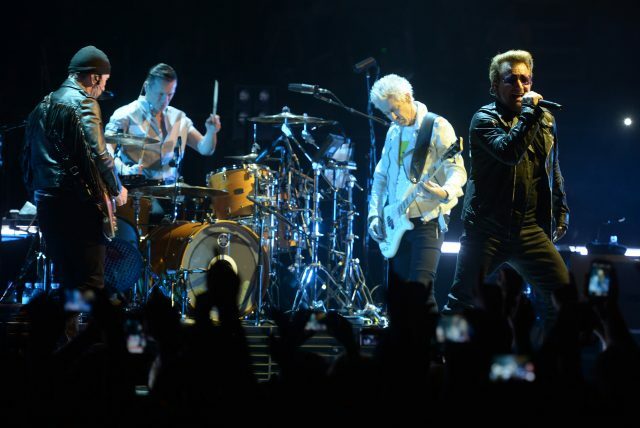 U2 continue to be one of the most legendary bands of all-time. While they’ve struggled with the image in the past, their brief foray as buskers on the NYC subway was enough to win over plenty of hearts and minds. The band dressed down in disguise to spend the entire day performing their hit songs for free to New York’s commuters, earning a fair amount of spare change before finally revealing themselves to screaming fans. The reveal is one of the most heartwarming things you’ll ever see. Superstar footballer David Beckham has a longstanding reputation for being somewhat shy and awkward in public. That’s what makes his skit on the Ellen DeGeneres show so much more enjoyable. As part of a popular segment where Ellen forces celebrities to don disguises and do whatever she tells them to, Becks spends the day in a Target store in Los Angeles, trying to persuade customers to try his own fragrance. As you can see, his disguise doesn’t hold for long. Must be the accent. As part of a charity fundraiser for After School programmes, the Terminator himself dressed up as Don, a regional manager for a chain of gyms in Los Angeles. In one of the funniest undercover celeb segments in history, Arnie strolls around the gym giving confused patrons nonsense advise about fitness and health, whilst responding to claims he “looks familiar” by claiming to be on an FBI Wanted list. Another reveal for the ages. In one of the most ambitious undercover celeb segments ever made, pop singer Katy Perry donned five disguises in order to crash five different birthday parties pretending to be an eccentric entertainer, as part of the music video for her hit single Birthday. She goes from air-headed princess to creepy petting zoo owner, to energetic Bar Mitzvah MC, to alcoholic clown and, of course, a washed-up, octogenarian former Vegas showgirl. The entertaining compilation is intended as a joke, but it certainly highlights Perry’s range and prowess as an entertainer. If you don’t cry during her reveal at the children’s birthday party at the end, you are made of stone. Whether it’s to improve their image or just to mingle with the fans in a normal setting, celebs love going undercover, and the fans love it too. Previous articleCable-cutting could appear to be more convenient, but are associated risks worth it?